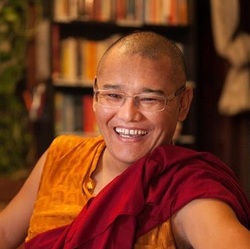 In 1987, when he was eleven years old, he traveled to his homeland of Kham and entered the religious life at Lho Lungkar Ogmin Thubten Shedrub Ling, where he studied ritual practices under the monastery’s senior lamas Gongyam and Drugsing for six years. Then, in 1994, he went with Thubnying Rinpoche to Jangchub Ling in the Holy Land (India), where he took the novice monk vows from His Holiness Chetsang Rinpoche. For two years he studied the Essence of the Mahayana Teachings and the Single Intention under Khenchen Konchog Gyaltsen Rinpoche as well as the ordinary subjects and the major scriptures with the Khenpos and teachers there. In the south of India, Khenpo received the great empowerment of Kalachakra from His Holiness the Dalai Lama after which, according to the expressed wishes of both the Khenchen Konchog Gyaltsen Rinpoche and Thubnying Rinpoche, he went to Bihar to study the major scriptures for eight years. In 1998, Khenpo received full monk's ordination from Mewa Khenchen Thubten Ozer Rinpoche. Since then, he has received the oral transmission of the precious Kangyur of the Buddha from Choje Togden Rinpoche as well as the pig, snake, and monkey year teachings from Kyabgon Chetsang Rinpoche. At the beginning of 2002, His Holiness Chetsang Rinpoche authorized and instructed him to teach at the Kagyu College at Jangchub Ling and in 2004 enthroned him as a Khenpo of the College. Then, in 2006, Khenpo returned to his own Lungkar Monastery to teach the monks and nuns of the monastic college, Jamyang Gatsel Ling, Gampopa's Jewel Ornament of Liberation. Currently, Khenpo Nyima Rinpoche resides at Jangchub Ling in India.